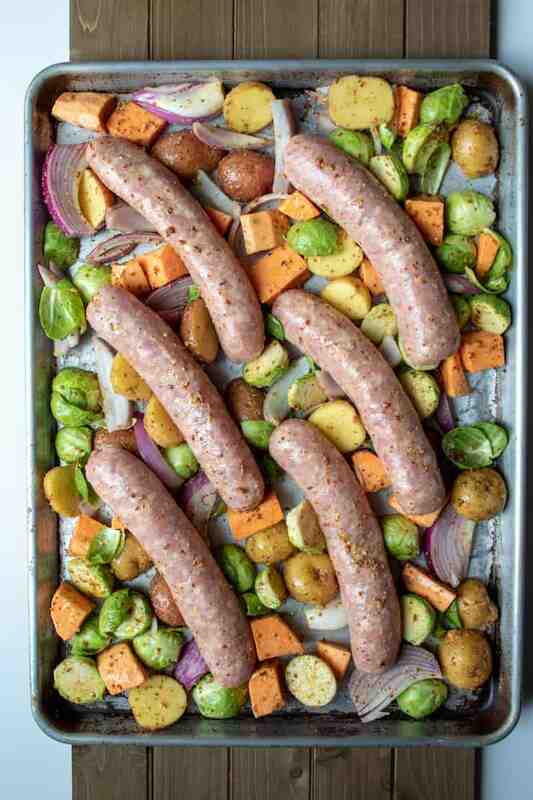 Sausage Sheet Pan Dinner with roasted vegetables is so easy and delicious for a quick weeknight meal. 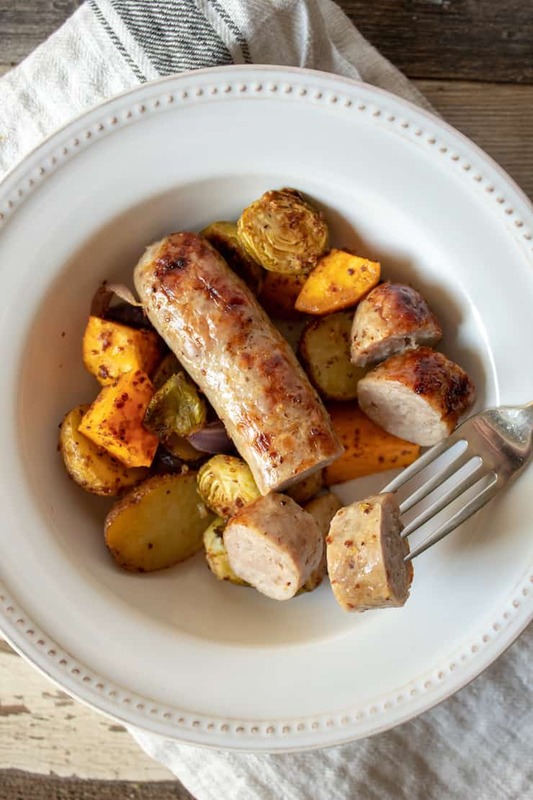 Vegetables tossed in a flavorful honey mustard sauce and cooked alongside the sausages become tender, sweet and caramelized ~ a winning combination with sausage! I’m all on board for sheet pan dinners, or tray bakes, but truth be told, I sometimes am a little disappointed. I guess it depends on what it is, some combinations just seem dry or less spectacular in the taste department than I imagined. 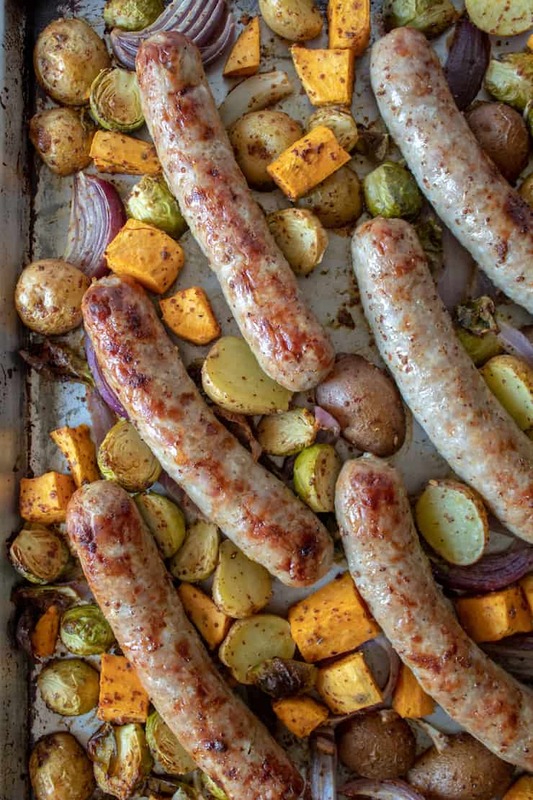 Not this sausage sheet pan dinner. It is exactly as I want it. I love fall-type vegetables that are roasted and caramelized. 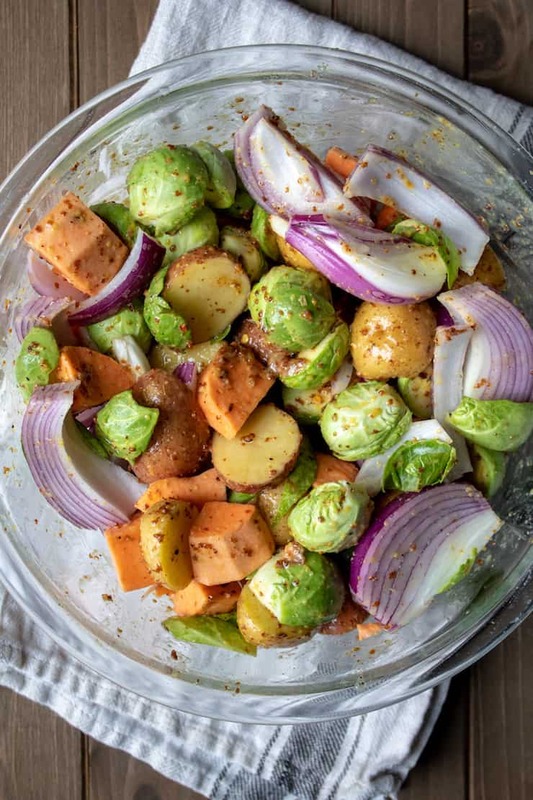 I used potatoes, both regular and sweet, red onion and Brussels sprouts. Just tossed them in a mixture of honey, grainy mustard, olive oil and some seasonings. Simple and tasty, on the pan they go with the sausages. I also don’t toss and stir the vegetables while they bake, I just flip the sausages halfway through the cooking time. I like the vegetables to just do their thing and caramelize, they seem to get browner when I just leave them alone. 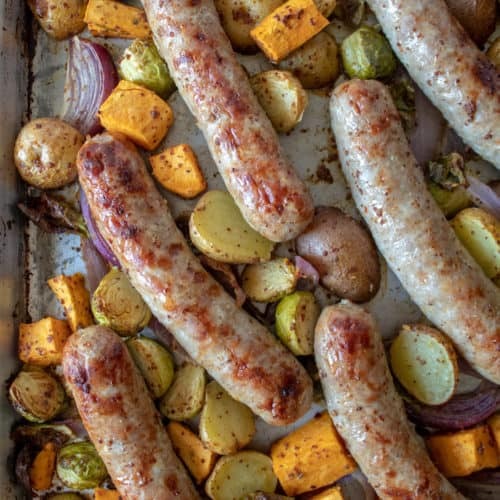 If you’ve tried this Sausage Sheet Pan Dinner, please rate it below in the comments and let me know how it went ~ I love hearing from you! HUNGRY FOR MORE? Subscribe to my Newsletter and come hang out with me on PINTEREST, INSTAGRAM and FACEBOOK for all the latest updates. 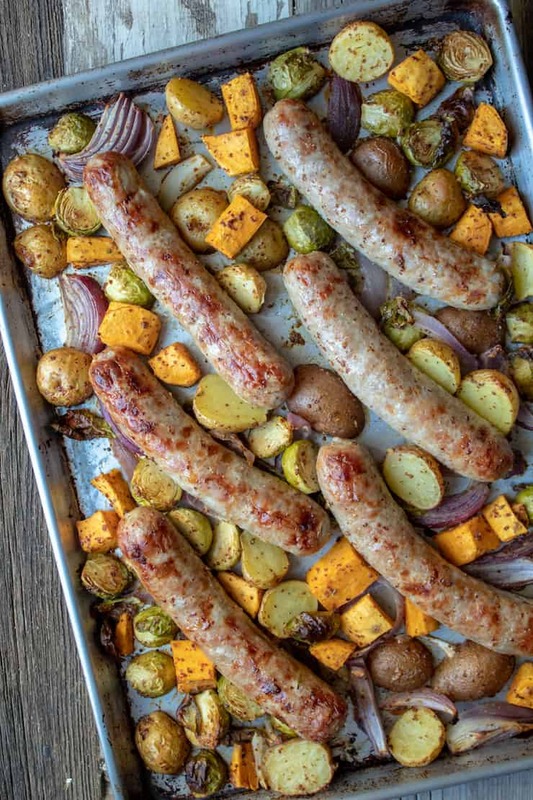 Sausage sheet pan dinner with roasted vegetables, tossed in a seasoned honey mustard sauce and roasted on a sheet pan until tender, browned and caramelized. Preheat oven to 400º. In large bowl, whisk together mustard, honey, olive oil, seasonings and red pepper. Season with a little kosher salt and fresh cracked black pepper. Add vegetables and toss to coat evenly. Leave any excess behind in bowl and arrange vegetables evenly on a large rimmed baking sheet. 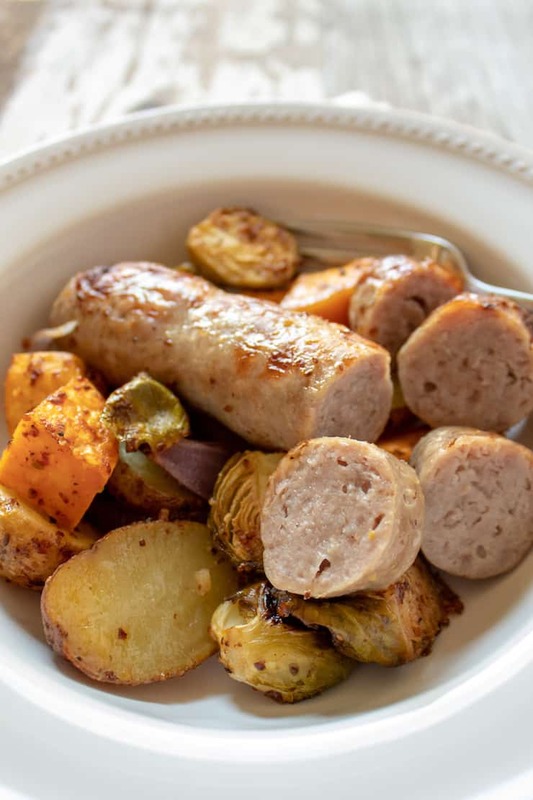 Pierce the sausages several times with tip of sharp knife and place in same bowl as vegetables; toss to coat with any remaining mustard-honey sauce. Arrange on top of vegetables on sheet pan. Bake in 400º oven for 40 to 45 minutes, flipping sausages and rotating pan halfway through cooking time. 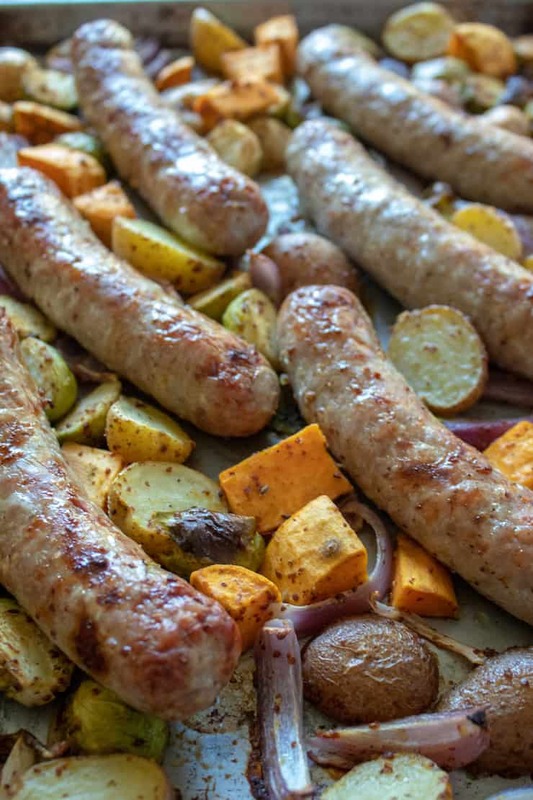 Remove when sausages are browned and cooked through and vegetables are tender and caramelized. Serve and enjoy! I like fresh sage and rosemary and still had some growing in my garden well into the fall and winter months. Use about 1 to 2 tablespoons total of these fresh herbs, minced. Or use about 1 teaspoon of dried spices, like Italian seasoning. I love fingerling potatoes in this dish but certainly any small new potato will work, like red, white or Yukon gold. Play around with the amounts of vegetables, add more sweet potato if you like, or even try parsnips or carrots. Lastly, I don't stir the vegetables while they are baking, I just flip the sausages. I like the veggies to just caramelize on their own, I don't touch 'em. Tender, sweet and caramelized ~ a winning combo with sausage!